Web content and blog articles. We all need them, but what do we do with them as their numbers grow (and grow)? It’s easy to get overwhelmed. How do you keep your content up to date? 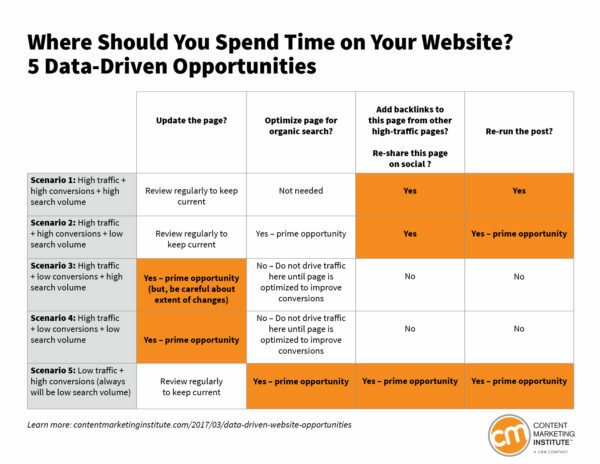 Which pages should you focus on? And what should you even do with the pages you are tracking? Today I’ll share a system for identifying which pages on your website deserve the bulk of your attention and what actions to take on these pages using a few key reports from Google Analytics. Ultimately, you’ll learn how to increase traffic to your pages already performing well and optimize the pages getting good traffic but aren’t performing to your expectations. Conversions: Number of people who took a desired action (subscribed, registered for an event, downloaded something, etc.) after reading your content. My recent post on how to use Google Analytics to determine some key data shows how to find these three key reports. Once you find this data, you’ll be able to look the various combinations outlined below, and different opportunities will emerge that you can prioritize. This post looks at five key scenarios you might encounter when reviewing your analytics for a given page of content. While each may seem similar at first glance, each requires different actions. Remember, your goals are to drive traffic to pages performing well and to improve pages getting a lot of traffic. This quick overview chart provides you with details on where you have the best opportunities. But keep reading to understand the opportunities and actions in more detail. Review the page on a regular basis (example: once per quarter) to make sure the page is current and includes links to your best-performing content. Make more extensive edits to improve the likelihood that a visitor will convert. The types of edits you may want to make are discussed in the scenarios below. Optimize your page to make it more likely that it will show up in organic search results. Mike Murray has an excellent post that details a 10-point checklist to help you optimize your pages for SEO. Review your other high-traffic pages and identify opportunities to link back to the high-converting page. Publish it again, framing it as “back-by-popular-demand” content (or, come up with your own term). It not only provides an opportunity to share your best content with a potentially new audience, but it can save your team some time and effort. Read about the details on how and when to republish your blog posts. These are your holy-grail pages: Lots of people visit them and, upon their arrival, they sign up for your email newsletter or take your desired action. For the most part, the list of what you need to do with these pages is short. Review these pages on a regular basis to make sure the information is still fresh, relevant, and accurate, and that it continues to convert well. Add links to other pages that convert well. Track these pages, link to them on other high-traffic pages, and continue to share them on social media. Re-run any blog posts that fit into this category. These pages are similar to the first scenario with one exception: People are not reaching these pages from organic search. These are the pages you should optimize for search to extend their reach and improve their chances of ranking well on search engine results pages (SERPs). If the page is a blog post, republish but optimize the new post for search. Review these on a regular basis to make sure they are up to date and continue to convert well. Include them on other high-traffic pages. Continue to share these on social. These pages are the most tricky of the bunch. They receive a lot of traffic from search, but not much happens after those visitors arrive. If the page topic is valuable to your audience, you want to keep the traffic coming to your website, but you need to update the page to make it more likely that visitors will take action. You must try to better understand what is happening with visitors on these pages. Review the data to answer questions such as: What patterns emerge? Are people exiting or delving deeper into the site? Where are they going? Are there other relevant high-converting pages and posts that may make sense on this page? Paste the URL of any web page in SEMrush to see which keywords are used by people to arrive at that page. Are these appropriate keywords for your brand? Are you addressing questions people on this page may have? Example: For instance, our Developing a Strategy page falls into this scenario. This page gets a lot of traffic from search, but it was not converting at a high rate. 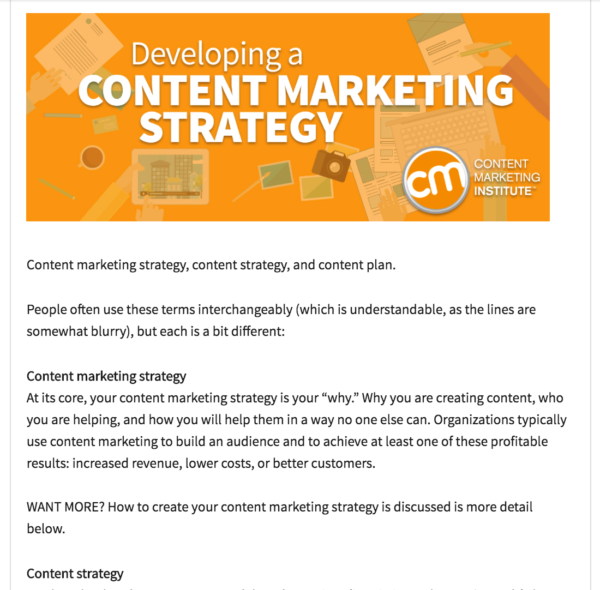 When we dug into SEMrush, we found that people were using words such as “content marketing strategy,” “content strategy,” and “content plan” to arrive at this page. As such, I recently updated the intro of this page to incorporate a discussion of these three terms and make it more relevant to those who search on them. TIP: To track how the changes impact the page, include an annotation in Google Analytics that reminds you what changes you made and when. On most charts in Google Analytics, you’ll see a bar with an arrow. Click the arrow, and you’ll have the option to add a new annotation. This scenario is similar to the one above. The difference is that these pages get a lot of traffic that is not from organic search. You can make changes liberally to this page without worrying how its search ranking may be affected. You won’t be able to dig into SEMrush to get additional data because of the low search volume. Finally, I prioritize those pages with high conversions but low traffic – and as a result, always a low search volume. These are the pages you want to share liberally! Your goal is to turn these pages into high traffic + high conversion pages. Optimize for search (see scenario 1 for suggestions on how to do this). Link to these pages from high-traffic pages. Continually promote these as evergreen pieces in social. Instead of trying to tackle all of your website pages in the same way, figure out where your key opportunities exist and take specific actions with specific pages. 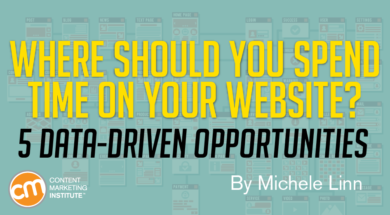 Of course, I’d love to hear from you: Are there other opportunities you are taking advantage of with your website? And want more? Download our popular eBook, How to Apply Analytics Data to Make Better Content Marketing Decisions with tips from Andy Crestodina, a top-rated and keynote speaker at Content Marketing World.